If you’re lucky enough to have grown up in a climate with four seasons, chances are you remember the unexpected joy and exhilaration inspired by those two simple words from the weatherman. The usual school day was quickly replaced by sledding, soap operas and snacks. Pure joy. Somewhere along the way, we grew up, got jobs and put our sleds in storage. Wouldn’t it be nice, if we could reschedule those meetings, and cash in just one vacation day in exchange for a snow day? If you haven’t already dreamt about what you’d do with a free day all to yourself, we can help. Breakfast lovers rejoice. One of the best ways to celebrate not needing to rush out the door in the morning is with a delicious breakfast. In fact these snow day favorites are so tasty, you just might want to savor them over lunch and dinner too. Ham and Swiss Breakfast Sandwich served on sourdough with fresh basil. 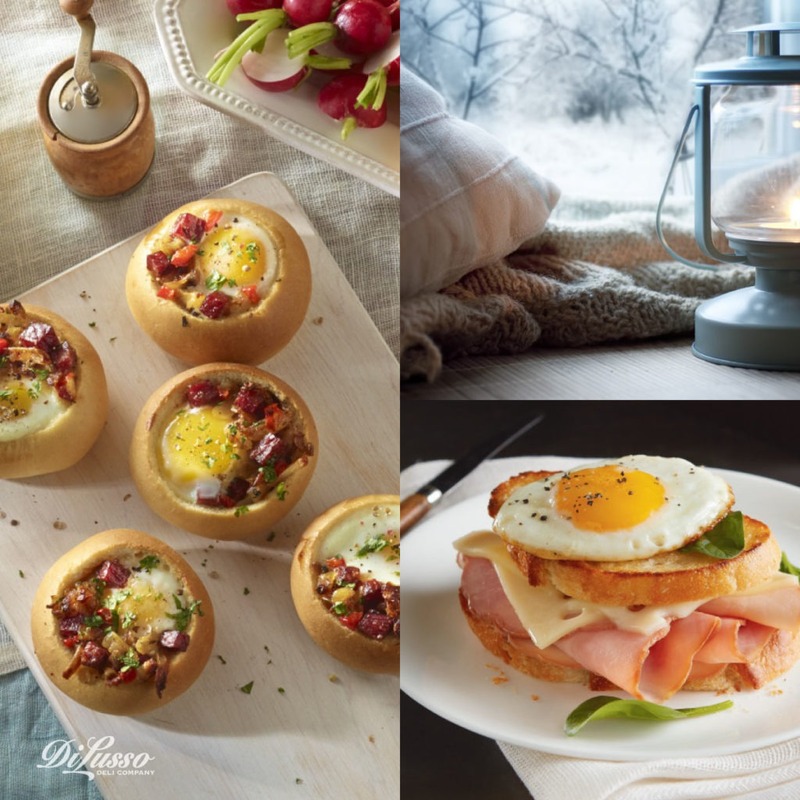 Mini Breakfast Buns with DI LUSSO® Corned Beef and seasoned hash browns. 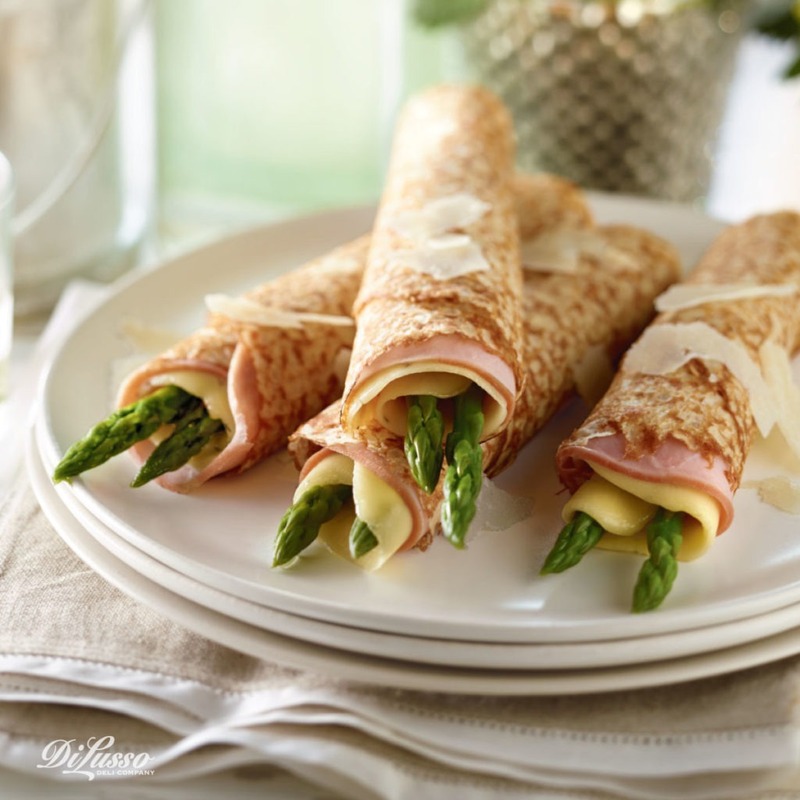 Ham and Asparagus Crepes with DI LUSSO® Havarti Herb Cheese and shaved Parmesan. An afternoon matinee or two from the comfort of your cozy sofa might be just what you need to make your grown-up snow day complete. Whether you’re binge watching on your laptop or catching up on all those movies you’ve recorded, you’re going need at least a couple of trips to the snack bar. Here are a few of our favorite bite sized crostinis that are almost as easy as microwave popcorn but far tastier. Balsamic Strawberry and Turkey Crostinis with cream cheese, DI LUSSO® Maple Turkey and fresh chives. Honey Pear Crostinis goat cheese crumbles and rosemary sprigs. 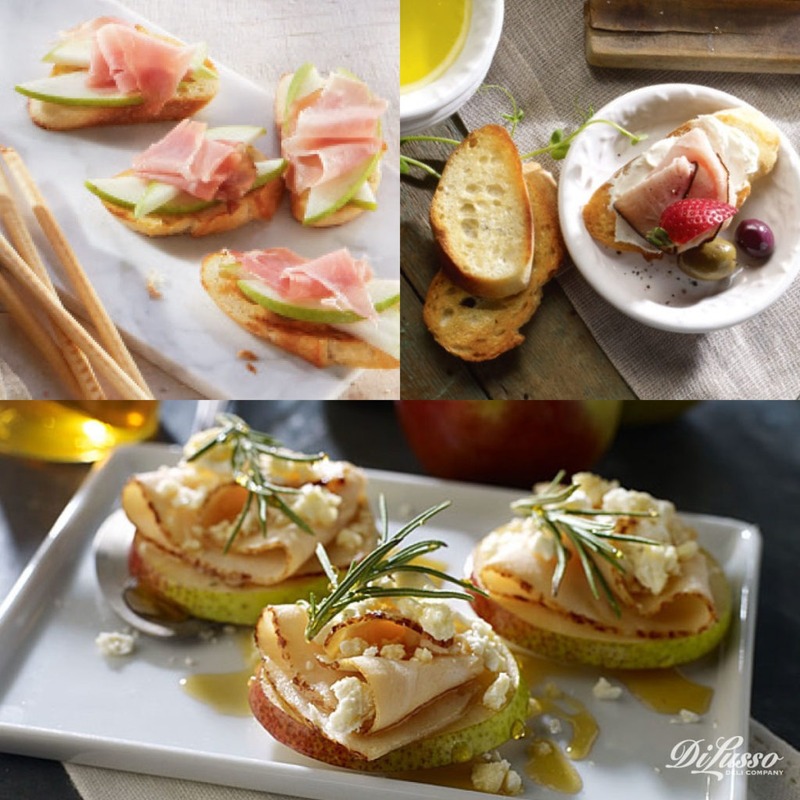 Prosciutto Pear Crostinis served on sourdough with DI LUSSO® Prosciutto Ham and broiled to crispy perfection. Indulging in an at-home spa day can do wonders to help recharge your batteries and your soul. Like a fragrant soak in the tub and one of those great reads from your nightstand you just haven’t had time for. Remember, it’s 5 o’clock somewhere, so a glass of Chardonnay can’t hurt. 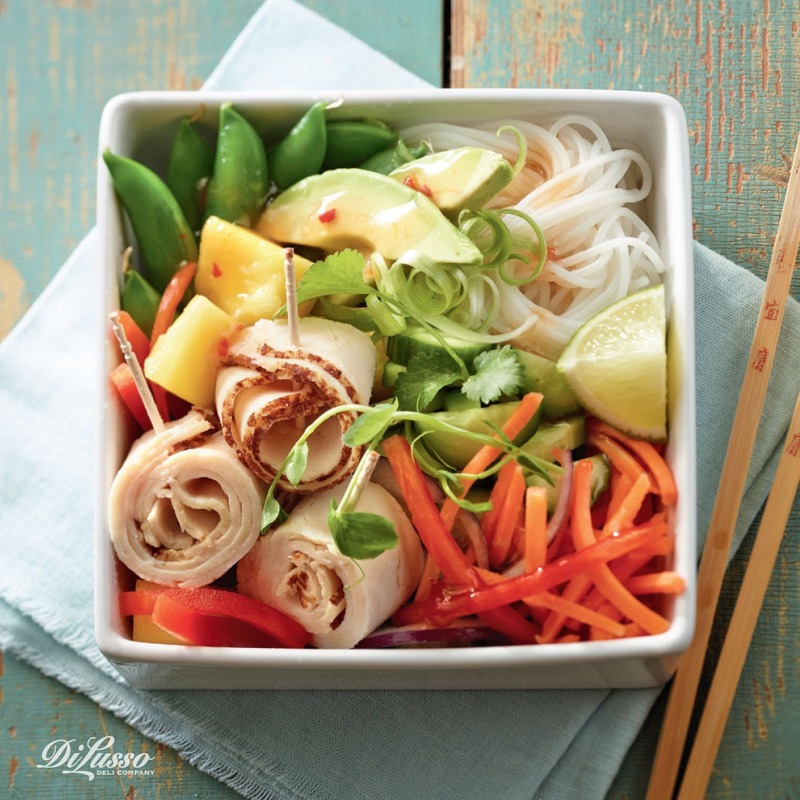 Especially when paired with this simple and elegant Mango Turkey Salad Bowl. We hope there’s a snow day in your weather forecast. If not, you know what to do.